Political prisoner Jane Cento called on the public to support opposition candidate Gordana Siljanovska – Davkova, as the best way to begin undermining the Zaev regime and to put an end to its campaign of persecution. Cento, who is the heir of the family name of Macedonia’s first President post World War Two Metodija Andonov – Cento, was sentenced to 15 years in prison under “terrorism” charges over the April 2017 incident in the Parliament building. Our victory is close. And it is coming closer and will be gained sooner if every honest Macedonian citizen rises in the fight against this criminal Government. Every day we lose gives another day to this criminal gang and allows it to continue its attacks and abuse of everybody who disagrees with it, reads a message distributed through Cento’s mother. His arrest drew parallels with the persecution of his ancestor by Tito’s Communist regime, for his refusal to embrace Communism and subvert Macedonian independence to Yugoslavia. Over time, Cento has gained an iconic status among Macedonians, especially those opposed to the Yugoslav regime, and was eventually officially rehabilitated as a political dissident. The renewed persecution of the family, with the incredibly lengthy prison sentence against Jane Cento, is seen as motivated by a desire to undermine its prominence and political clout. We are at a crossroad, and we must decide whether we are prepared to defend our national interests or if we will continue to surrender and withdraw before this gang. We are going through a national disaster and keep sinking lower and lower. Everywhere around us are disappointed faces, humiliated citizens, sad people, a collapsing system. We lived to see the Prime Minister and the Ministers in the SDSM Government silently refuse to acknowledge our brothers and sisters in Aegean Macedonia, to see them afraid to acknowledge that there are people living there who speak Macedonian, who are Macedonians. Even in the darkest hours of slavery, our occupiers never sunk so low, but today, we have a Prime Minister of the Republic of Macedonia who denies that Macedonians live and speak Macedonian there, Cento writes. Before his sentencing, Cento was attacked in prison by the guards, in an attempt to silence him. Prison authorities attempted to dismiss the attack as provoked by the prisoner, but eventually, after two other political prisoners were attacked by Albanian terrorists, the Government agreed to remove the warden who allowed the attacks. 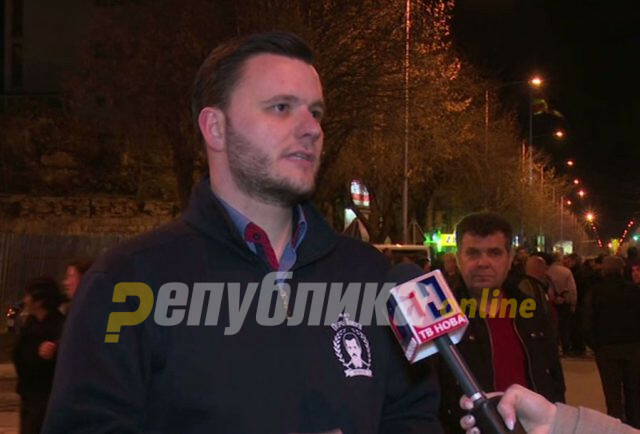 Cento also urged the conservative wing which is calling for a boycott of the elections as a way to delegitimize the imposed name “North Macedonia” to rethink its decision. “Dear friends, we have a chance to see the end of this criminal gang in the second round of the elections. Therefore, I urge you to vote in the first and the second round. Let’s show the gang that the people is not behind it, that the people are taking their country back”.